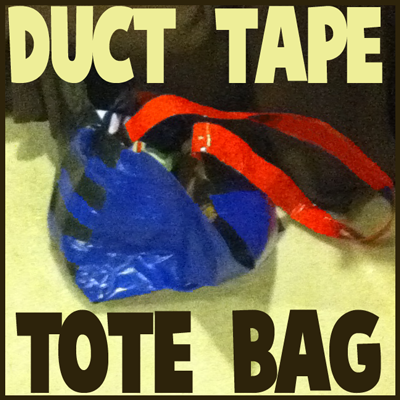 Today we will show you how to make a very sturdy tote bag out of nothing other than duct tape. This duct tape bag is able to hold about 30 hard covered library books without tearing. You can also make these for grocery shopping so that you don’t have to waste plastic and paper bags. 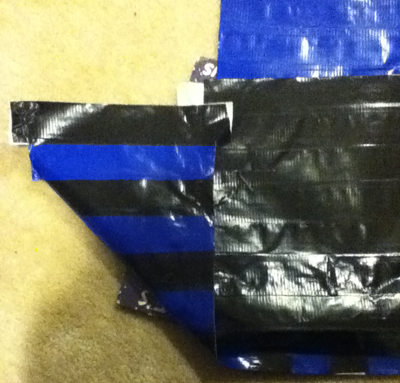 Learn how to make this cool duct tape bag with the following steps below. We aren’t going to give you any specific measurements because we don’t know how big or small you want your bag. I wanted a huge bag to hold my library books, but you might just want a normal sized tote bag. Firstly, we make the fabric. The way that we make the fabric is by sticking tape together, stick end to stick end. 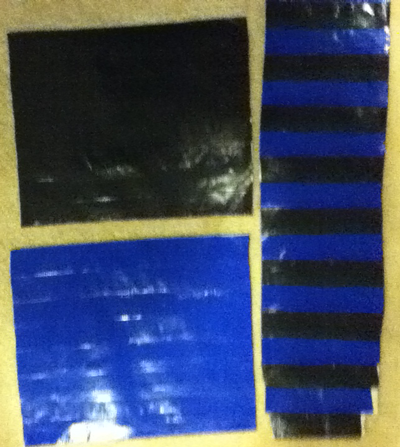 When you have one strip done, then take another piece of tape and stick it lengthwise along the finished strip (illustrated above). Then turn it around and cover up the sticky part with another piece of tape the same size. Make 2 rectangles about the same size (it is optional to make them 2 different colors) and one long rectangle that is a little bit longer than the combined height of both of the other rectangles that you made. 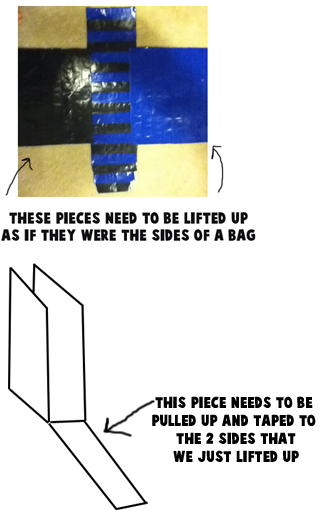 Now duct tape them together like the picture above….the long strip in the middle and 2 around it as if it ere a bird or airplane. 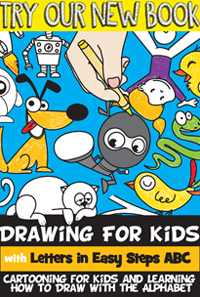 The above illustrations show you how you will need to tape the sides together. You might need an extra hand to do this so ask a friend or parent or sibling if you need some help. Here is a picture of me taping the sides together. 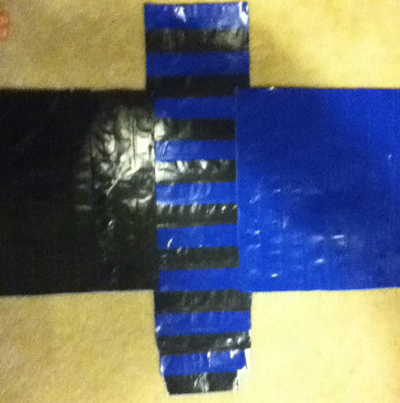 I taped together the strap by taping end to end pieces of tape. 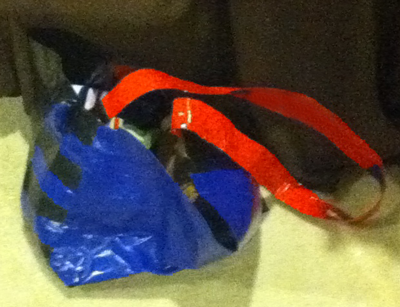 I then cut a hole in the bag, pulled the strap through and taped from the outside and the inside of the bag. It seems to hold really well. 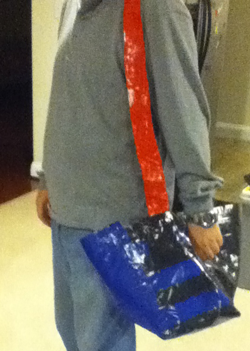 Finished Duct Tape Tote Bag. Cool bag 😀 I have seen these in stores for quite a bit of cash! Thanks for showing us how!